This week, let’s go quiet together. Let’s listen more and update less. Let’s hear each other’s silent screams of fear and anxiety. Let other people fight to have their voice heard. Let other people have the last word. Let other people be right. This week, you are sitting back, waiting. This week, you are smiling and nodding. This week, you have nothing to prove. If you must speak, whisper. Leave the yelling for another week. Leave the lectures for another week. Be a silent warrior. Do things without asking. Wash them down with a nice cup of tea. When you feel the urge to speak out, breathe instead. Shush yourself again and again. 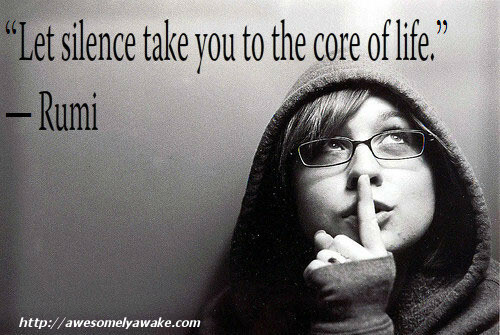 What do you discover at the core of your being? Maybe you aren’t going screen-free this week. Maybe you aren’t interested in being quiet. If so, there are always past weekly intentions you can read and take hold of — do only what you need right now. You’ll know what’s calling you. Until we learn the hard way, right? : ) I only write what I know. xo to you. Thank you so much for reading. Today is the day! Thank you! There is just something so powerful about staying silent, isn’t there? Why it has taken me this long to figure it out is beyond me! : ) Happy Quiet You. I absolutely need quiet time to recharge and those are the days that silence is the most beautiful noise in the world. Love this post! It’s always nice to have silent moments in life…to not pay attention to the social media and other noise that can confuse our mind! My goal for next week.